Have you ever stepped into a public elevator and felt terribly uncomfortable? You probably didn’t develop claustrophobia overnight. You’re likely experiencing the discomfort of entering a small, quiet, enclosed space with a handful of random strangers. Never fear: Social norms haven’t completely disappeared once you enter the confines of an elevator. 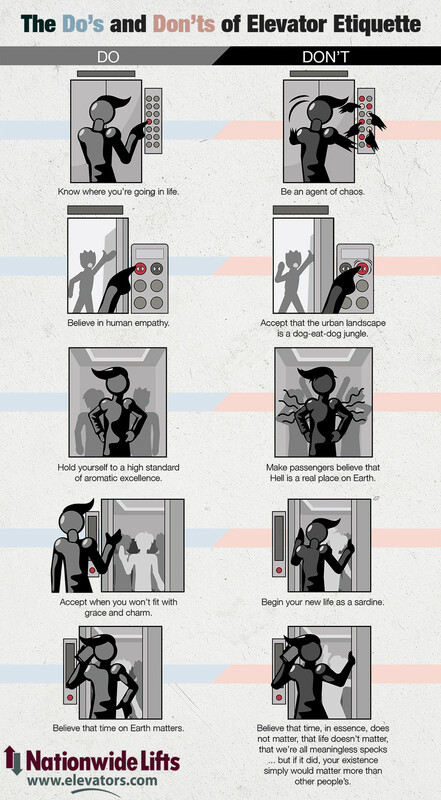 Following some basic elevator etiquette can ease your intense fear of making accidental eye contact with a stranger. If that isn’t a relatable feeling, use these tips to speed up the shuffle in and out of the elevator doors instead. Your more socially anxious fellow passengers will thank you (silently, of course). 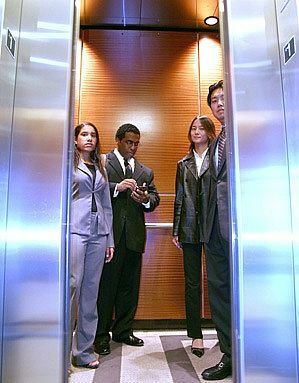 Let’s break down the elevator ride one step at a time with a few do’s and don’ts of elevator etiquette to consider. DON’T: Form a mob around the elevator doors. Put yourself in the shoes of the passengers: You were just trapped in an enclosed space for one of the longest minutes of your life, but now the doors are opening, freedom is yours … except your exit is blocked by a mass of human bodies. Don’t block the only exit for the passengers inside. DO: Stand to the right of the elevator doors. This will clear a path for the passengers waiting to exit on your floor. DON’T: Rush the elevator doors. Unless you’re planning a heroic rescue on the upper floors, it’s almost guaranteed that the passengers inside are more eager to exit the elevator than you are to enter. DO: Wait for passengers to get out before getting in. This is one of the most important rules of elevator etiquette. Following this rule will organize the flow of people into and out of the elevator, speeding up the process while removing stress and irritation. DO: Move toward the back or sides once you get in, clearing the space closest to the doors for other people to enter. To hold the door or not to hold the door? This is one of the most important questions in elevator etiquette. These guidelines can help you make a wise and polite decision. 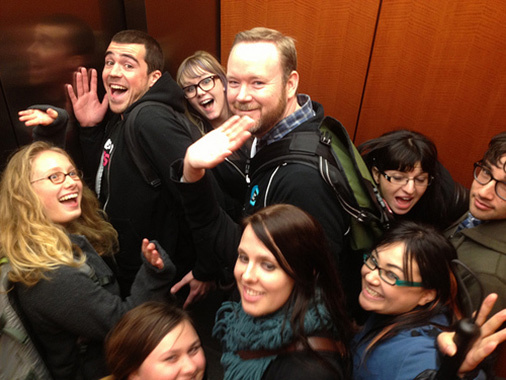 DON’T: Invite a game of sardines by holding the door when the elevator is already packed. The personal space parameters naturally have to shrink a little in an elevator, but why stretch those boundaries further? Be considerate of fellow passengers who do not want to test the accuracy of the elevator’s listed maximum capacity. DON’T: Hold the elevator door for a friend who got delayed while they picked up coffee, used the restroom, tied their shoes, got distracted by a pigeon, etc. A good rule of thumb is to never hold the door for longer than 20 seconds on a busy elevator. DON’T: Squeeze your way into a crowded elevator or ask for the door to be held for you so you can squash in. You force the door-holder to make a difficult decision: live with the guilt that they ignored your request, or anger an entire elevator full of people. This is poor elevator etiquette and possibly bad elevator karma. DO: Hold the door if you are alone. The only person you will inconvenience is yourself, so you might as well do a good deed for the day. DO: Hold the elevator if it is not too crowded and you see someone making a serious hustle to catch it. You wouldn’t want to ruin someone’s day, would you? If you really can’t stand to hold the door, do the decent thing and pretend you didn’t see them. But why not build up some good elevator karma? These tips will help you practice good elevator etiquette when it comes to pushing literal elevator buttons so you can avoid pushing figurative passenger buttons. DON’T: Press all of the buttons at the same time just to see them light up. It seems unlikely that anyone would actually do this, Buddy the Elf-style, but just in case, we present this friendly reminder. DON’T: Ask someone to press your floor button for you if the panel is within reach, unless, of course, you have two broken arms. DON’T: Place yourself in front of the button panel and then refuse to press buttons for others or act grouchy about the situation. When you choose to stand in this spot, you have designated yourself as the button-pusher for passengers who are out of reach, and you must accept this role. There is no turning back at this point. DO: Take your elevator etiquette to the next level when you are the button-pusher and ask passengers entering the elevator which floor they are traveling to. DO: Admit to making the mistake of pressing the wrong button. When the doors open on the wrong floor and no one enters or exits the crowded elevator, the other passengers will be more forgiving if you admit to being the phantom button-pusher instead of letting the mood become hostile like an Agatha Christie whodunit. No one likes having their personal space invaded, especially by a stranger. 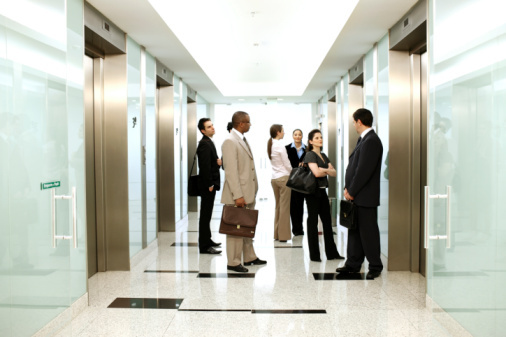 Good elevator etiquette will go a long way in making the elevator ride a painless process. DON’T: Eat in the elevator or spray a fragrance. Your spicy Thai takeout or luxury eau du toilette is not a wonderful scent to everyone, no matter how much you personally may enjoy it. DON’T: Gossip loudly with your friends and coworkers or give out state secrets in this small-but-public space. DO: Keep your voice at a library-level volume and keep the conversation light, sticking to positive topics that can’t be interpreted as rude, like ice cream or puppies. DO: Try to respect personal boundaries, although in a crowded elevator, occasional shoulder-touching is often unavoidable. DO: Try to avoid burping. And please, cover your sneezes and coughs. You have arrived at your floor, and armed with this knowledge of elevator etiquette, your future elevator journeys should be much more enjoyable and stress-free. 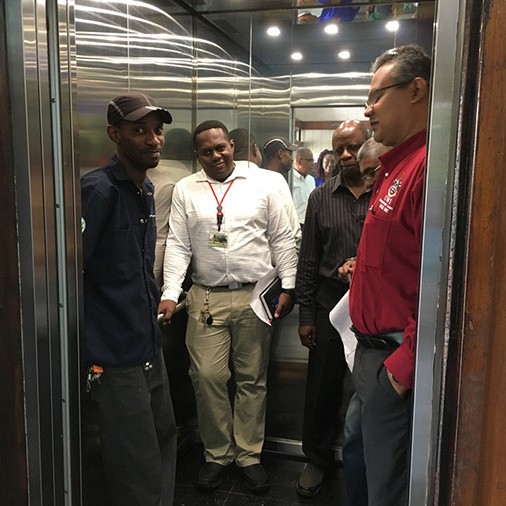 There’s no need to avoid an elevator when you are aware of these simple rules: No one wants to climb 20 flights of stairs when they could take a quick and easy elevator trip. DO: Exit the elevator quickly to make room for the passengers waiting to board.